Finding the perfect gift for that loved one who is difficult to shop for doesn�t have to be a battle. You can customize a piece of unique jewelry to create a one-of-a-kind present that he or she will wear daily. Rings can be personalized with a name or initials or a meaningful date such as a birthday or anniversary. This engraves a remembrance in precious metal of a special time. 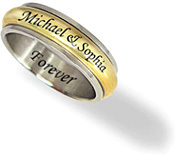 Personalized rings make memorable presents, a remarkable gift that can be used again and again. Read more. Unlike a book or DVD that will languish on a shelf gathering dust, perhaps taken out occasionally, a personalized ring is, by design, a form of wearable art, an item to become symbolic of the self and a meaningful relationship. The name or even birthstone of a loved one may be chosen to customize a ring, making it a special and incomparable accessory. No one else will have one quite like it, because there are not duplicates on a rack at the mall. Personalized rings are distinctive, marked out as exclusive, peculiar to a single wearer. While many friends may compliment it and wish for one of their own, your personalized ring will remain the only one of its kind, honoring your individuality. Personalized rings are available in a variety of precious metals including silver, yellow gold and white gold. Some offer accent stones such as a birthstone, while others can be engraved on either the exterior or interior of the band, or even both. A number of personal choices in design help create the significance of your particular customized ring. Choose the metal, saying or name, and even the font for your personalized rings, putting your own stamp on the making of a piece of very individual art. 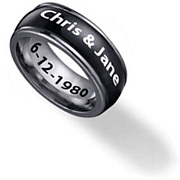 Personalized rings make a romantic gift when engraved with the dates of special events such as your engagement, your wedding, the birth of a child. Perhaps a meaningful Scripture quote might be inscribed along the interior of the band, a secret unseen by any eyes but yours and the giver�s. Find a way to distinguish a loved one with the gift of a personalized ring bearing a significant name or message, and you may want another of different design for yourself. The personalized rings we choose to give or are lucky enough to receive perhaps best exemplify the artisanal quality of custom jewelry.